Starting at the intersection of Lovell Rd & Pipiwai Rd (1464–362 / 1293 – 319 included) travel north east along Lovell Rd then north along Otakairangi Rd (292 & below Year 7-8included). From 292 travel east crossing Heaton Rd at number 461, then continuing north east to meet the intersection of Hukerenui Rd and Forsythe Rd (excluded). Travel south along Hukerenui Rd and Jordan Valley Rd 323 / 354 and below excluded continue south east excluding Apotu Rd to meet Crane Rd at numbers 397 and 380 (and below included). Continue south along Crane Rd then west along both sides of Pipiwai Rd, Church Rd excluded. Travel south west across country to meet 710 Three Mile Bush Rd then continuing south to Gumtown Rd including James Rd & Gray Rd. Travel west across Kokopu Rd (175 & 138 and below included) and travel along Attwood Rd north east along Knight Rd (44 included only). Travel along both sides of Appian Way (Worsnop Rd included) and back to the starting point. 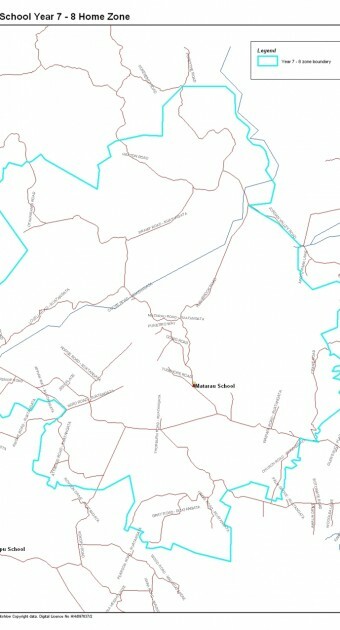 Is the same as the Year 1-6 zone but includes both sides of Church Road. All residential addresses on included sides of boundary roads and all no exits roads off included sides of boundary roads are included in the zone unless otherwise stated.